Signing for a club without a permanent manager in place was of no concern to midfielder George Moncur. The 25-year-old headed from Barnsley to Luton last week, despite the Hatters currently searching for a new boss after Nathan Jones left for Stoke earlier this month. Whoever comes in, I’m just going to have to try and knuckle down and get myself in the team. When asked if it had weighed on his mind at all, Moncur said: “No, just because of the fact that I knew I’d been watched by the likes of Gary Sweet for a while, so I knew that I was wanted here. 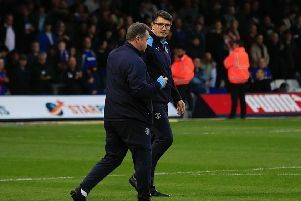 With interim boss Mick Harford also the chief recruitment officer, then Moncur had clearly been on Town’s radar when Jones was still at the club. It was Harford who made the deal go through too, with Moncur saying: “Mick as well played a big part in me coming down, so fair play to him and I really respect him for letting me come down here. When asked just what Moncur will bring to the Hatters, Harford said: “He’s a clever player, he moves the ball, he puts defenders on the wrong foot, he shifts it side to side and gets his shots away. Moncur knows he faces a battle to break in too, adding: “There’s so many players who have got great quality, so it’s going to be tough to get a place in the team.